All images shown here were taken unguided, using a 10" LX200R at prime focus, unless otherwise specified. The focal reducer I occasionally do use is an OPTEC Lepus 0.62X. Comment: This 8.5 mag globular is fairly remote at about 24,000 light years from Earth. It has a true diameter of about 170 light years with a very low star density even at its center. The extremely low metallicty of its stars also suggests it formed earlier than the arms of our galaxy. Comment: I managed to get superb focus for this globular. This one is actually somewhat elliptical and quite large (approx. 165 light years in diameter), consisting of over half a million stars. It is approximately 24,500 light years away and is known for its unusually large number of RR Lyrae variable stars. Comment: This is one of the densest globulars in the Milky Way with an actual diameter of only 95 light years. It's about 32,600 light years distant. The colors of the various stars came out extremely well, but unfortunately, my focus was a little off. Comment: This somewhat obscure globular, the sibling of M13 and M92, is one of the more remote globulars, at a distance of about 100,000 light years from the Sun. It's considered to be a "typical" globular and has recently been studied for its "blue stragglers" - stars that appear to be hotter and bluer than other stars of the same luminosity. Comment: The second lowest metallicity globular in our galaxy - about 29,000 light years from Earth. Comment: This is a reprocessed version of my original image here which previously had a little too much purple/blue! M2 is over 175 light years in diameter, making it one of the largest globular clusters known. It is approximately 37500 light years away and also about 13 billion years old, almost as old as the Universe itself! Comment: This metal rich globular is only about 40 light years in diameter, with a tight 1.5' core. It is located about 15000 light years away and 8000 light years from the center of the galaxy, well out of the central galactic plane. Hard to believe Herschel missed this one! Comment: M13 is about 145 light years in diameter and over 25,000 light years distant. Finally, an updated version of this beautiful globular! Interestingly, the very distinctive "tendrils" I saw in my earlier processed version here are gone! Of course, the larger number of stars may simply be masking the pattern of stars visible before. Comment: The second of two faint Delphinus globulars, this one is closer, but still over 50,000 light years away. Like its companion, it also has a highly eccentric galactic orbit and is one of the three most energetic globular clusters orbiting the Milky Way, along with NGC5466, and NGC7006. Comment: This globular is about 25,800 light years distant but only about 5,500 light years from the center of the Milky Way - so close in fact, that its shape is affected by our galaxy's gravitational pull. The 90 light year diameter globular has a beautiful mix of red and blue stars, clearly visible in the image. The dark void to the right and south of the globular is actually a dark nebula named B64! At first I thought I had imaged into some tree leaves! Comment: M71 is rather small with a diameter of only 27 light years at a distance of about 12000 light years. It is relatively young for a globular (9 - 10 billion years) and is considered to be a very loosely concentrated globular. Comment: Magnitude 8.3 globular in Lyra follows a retrograde motion around our galaxy. It is thought to be a possible remnant from a past merger between our galaxy and a dwarf galaxy whose nucleus remained as the globular Omega Centauri! At a distance of about 32,900 light years, it's somewhat smaller than average at about 85 light years in diameter. Comment: At about 33,000 light years from Earth, this 105 light year diameter globular is one of the most metal poor globulars in our galaxy - so abnormally metal poor in fact (containing less than 1% of the heavy metals our Sun has) that it is has been suggested our galaxy captured this globular from another galaxy we absorbed eons ago. 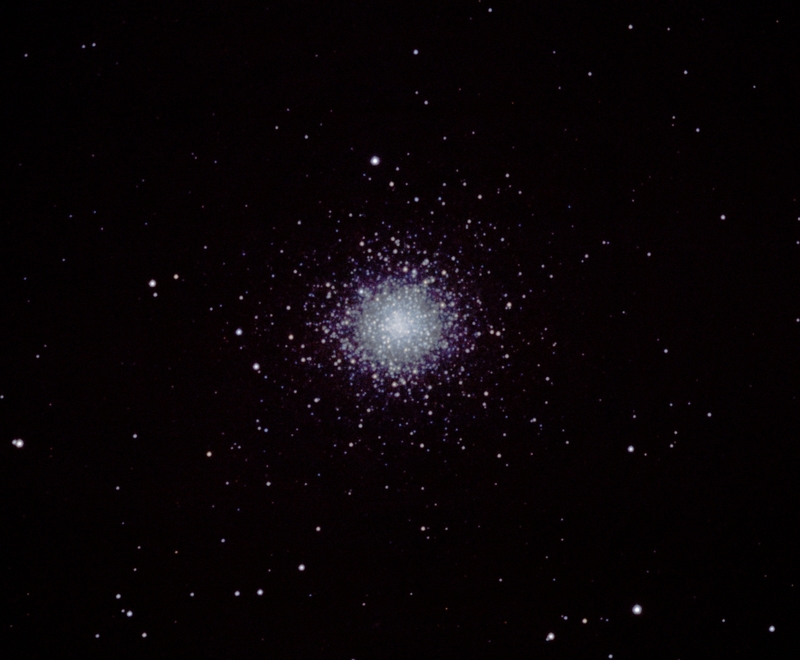 M68 has recently been used to revise globular cluster age estimation techniques, resulting in lower estimates that are more consistent with the most current age estimates of the Universe. Comment: The low altitude of this cluster makes the colors of the stars stand out in this image. This is a beautiful little cluster, with a rather bright and condensed core. It's about 2,800 light years away and located about 20,000 light years from the galactic center. Comment: This dense core globular is about 40000 light years away. It is thought to be migrating from the Canis Major dwarf galaxy currently undergoing a close encounter with the Milky Way. Comment: With an apparent magnitude of 5.5, this is actually the brightest globular in the Northern sky. It is also one of only four globulars found to contain a planetary nebula. Because of its proximity to the central bulge of our galaxy, it has also been useful as a microlensing instrument for investigating our core. Overall, this is beautiful globular, rivaling, if not exceeding the majesty of M13. At a distance of only 10,600 light years, it has a diameter of about 100 light years. Comment: This globular is about 22,500 light years away. Although at about the same distance from us as M13, it is only about 64 light years in diameter making it appear significantly smaller. Nevertheless, it's in a beautiful star filled field, making it a sensational little gem. Interestingly, in its orbit it comes to within only 1000 light years of the galactic center, where its outer stars are thought to be constantly thinned by the center's gravitational field. Comment: M53 is on the other side of the metallicity spectrum from M3, containing an abnormally low level of metals. It is about 220 light years in diameter but quite distant at a range of almost 60000 light years. Comment: In 2013, M62 became the first Milky Way globular cluster to be found to have a black hole at its core. Located about 22,000 light years from us, it's also one of the most irregular shaped globulars in our galaxy. At mag. 6.5, the cluster is about 100 light years in diameter and only about 6000 light years from the galactic center. Comment: M15 is about 33,600 light-years distant, and fairly large at 175 light years diameter. M15 is also one of the densest globular clusters known, believed to be in a state of core collapse. In fact, the closer Hubble looks into its center, the more stars are visible, with its density continuing to increase to within 0.06 light years of the core! It is still unclear if the central core of M15 is packed so dense simply because of the mutual gravitational interaction of the stars it is made of, or if it houses a dense, supermassive black hole. M15 also contains 1 of only 4 known planetary nebulae in Milky Way globular clusters. Comment: M14 is at about the same distance as NGC6440, but unlike that cluster, this beautiful, slightly elliptical globular is relatively metal-poor. At about 100 light years in diameter, it is slightly larger than M12 and M10, but fainter because of its distance. It is considered to be a very average example of a globular as compared to the other 157 globulars in our galaxy. Comment: Ok, so technically this is an open cluster. However, it was discovered by Herschel in 1784 and for a while thought to be a globular by Rosino and Hogg. Today, it's nature as an old Galactic open cluster is well established, with an age estimated at about 2 billion years. Comment: This very loose globular is about 20,900 light years away. I was a little dissappointed on how this turned out, but the low altitude of this object might have been a factor. I will have to try again next summer! Comment: At magnitude 10.6, this is one of the furthest globular clusters, at a distance of approximately 140,000 light years. It has a highly eccentric orbit, and is known to moving away at a fast 250 miles per second. Its small size and mag 16 stars make it a challenge to image! Comment: Focus wasn't perfect, causing some star bloat, but not too bad. This is one of the closest known globulars, only about 7000 light years away. I love globular clusters because every single one has a character of its own. This globular, in particular, has multiple "beaded" strings of stars, looking like tendrils extending in and around the cluster center. Of course, these are probably not physical connections, but beautiful nonetheless. Comment: About 15,000 light years from Earth, this globular's core is more compact and brighter than its near twin, M12. You can easily distinguish two major stellar populations: blue stars in the core and brighter orange colored stars on the periphery. The latter are red giants which, having exhausted their hydrogen in the cores, are now burning hydrogen in their outer shell. The blue stars are supergiants, in a fairly stable phase of helium burning in their cores. Post-processing matters! Spent some time color balancing with non-linear contrast enhancement to bring out the beautiful and varied colors of the core. Comment: Messier 3 is a prototype of a Oosterhoff type I cluster, known as a "metal-rich" globular cluster. It also contains the largest number of variable stars out all the Milky Way globulars. It has a diameter of about 180 light years, and is about 33900 light years distant. Comment: This very compact globular is about 28,000 light years away near the center of our galaxy. It is one of the most metal-rich globulars in our galaxy and has been extensively studied by Chandra for its multiple neutron stars and x-ray sources. In the sky, it is less than half a degree from the Box nebula NGC6445. Not sure if my focus was a touch off, or if the image was a little degraded due to the low altitude of the globular in the sky. Compare with NGC6293 - about the same distance and size, but significantly more compact! Comment: This globular is about 24,100 light years distant, but I could not find an estimate of its diameter. Comment: A beautiful globular cluster in Hercules, often overshadowed by its larger upstart M13. The stars in this image are somewhat sharper as compared to the stars in M13, which I took not yet using my Bahtinov mask for focus! 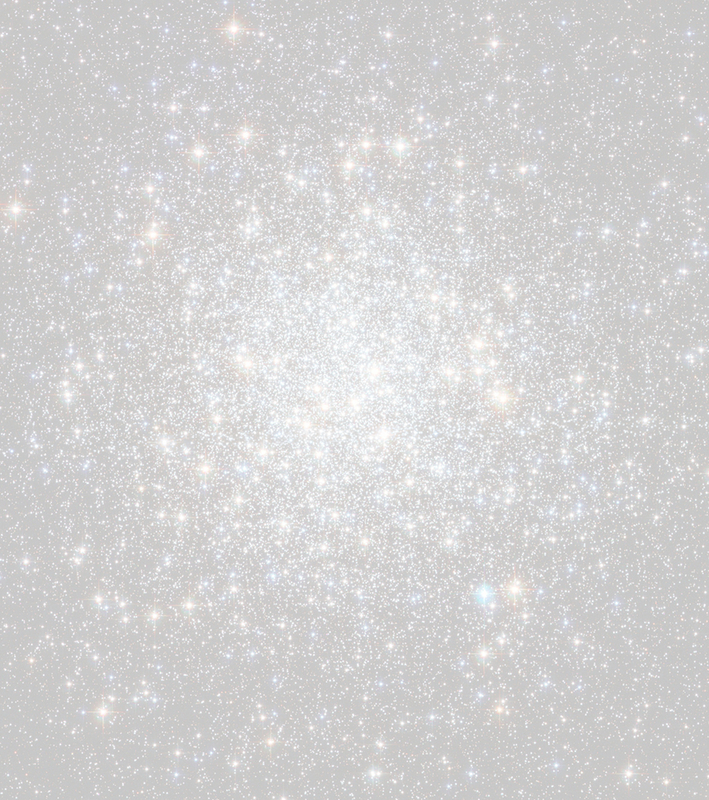 It is an example of an Oosterhoff type II globular cluster, which means it belongs to the group of metal poor clusters. It is about 110 light years in diameter and approximately 26700 light years distant. Comment: Great focus and dark frames - a perfect formula for success! This remote globular cluster is known as the "Intergalactic Wanderer" - at an approximate distance of 280,000 light years, it's the furthest globular cluster in our galaxy, orbiting once every 3 billion years! Its small apparent size and faintness belies its true nature as one of the brightest and most massive globular clusters in the galaxy. I was able to get it into really nice focus using my Bahtinov mask. Normally, I select a fairly bright star to do my fine focus. However, this time I used a much smaller fainter star that seemed to enable me to improve the accuracy of the Bahtinov pattern - which I think paid off! Compare with NGC6440 - the Wanderer is 10 times further away and *still* bigger! Comment: M12 is about 15,700 light-years from Earth and has a spatial diameter of about 75 light-years. The optical focus on this globular I think was superb, giving me the most crisp globular image to date. M92 was also really clear, but I think this one surpasses even that.